The future of themes is here! Themes have always been an integral part of the add-ons ecosystem and addons.mozilla.org (AMO). The current generation of themes – also known as lightweight themes and previously known as Personas (long story) – were introduced to AMO in 2009. There are now over 400 thousand of them available on AMO. Today we’re announcing the AMO launch of the next major step in the evolution of Firefox themes. If you follow this blog, this shouldn’t come as a surprise. We’ve talked about theme updates a few times before. We actually turned on the new theme submission flow for testing a couple of weeks ago, but didn’t remove the old one. We’ve now flipped the switch and AMO will only accept the new themes. Change other aspects of the browser, like the color of the toolbar icons, the color of the text in the location bar, and the color of the active tab. Set multiple background images, with different alignment, and tiling. You no longer need a massive background image, or make guesses about the width and height of the browser toolbox. Use color transparency to make interesting color blends. A detailed list of the supported theme properties can be found in this MDN article. If you scroll down to the compatibility table, you’ll find many properties that only very recent versions of Firefox support. That’s because Firefox engineers are still adding new theme capabilities, making them more powerful with every release. 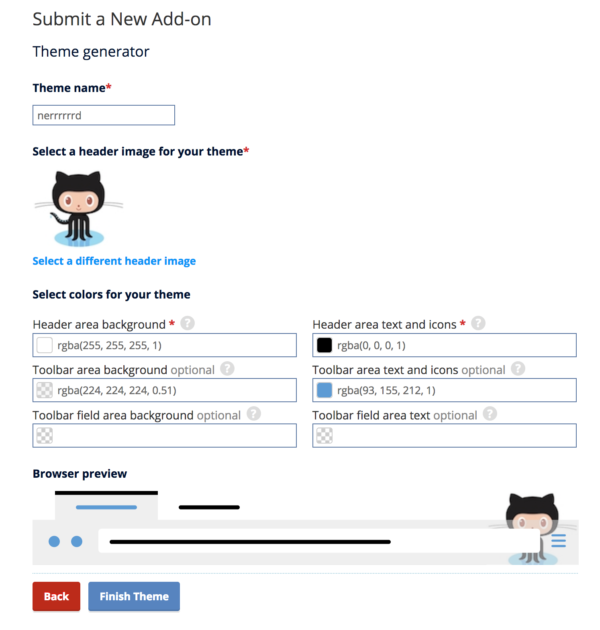 If you’re a theme designer, the submission flow for themes has changed a bit. In the Developer Hub, the Submit a New Theme button will take you to the new submission flow, which is the same used for extensions. You’ll be able to choose if you want to host your theme on AMO or distribute it yourself. This feature has been available for extensions for years, and it allows you to create files you can host on your website or keep for personal use. More on Distribution. On the next step, you can choose to either upload an XPI file or Create a Theme. The outcome of either path is the same. These instructions explain how to build a theme XPI. If you prefer using a wizard like the one we had for lightweight themes, click on the Create a Theme button. The new wizard supports the theme features of its predecessor, as well as some of the new ones. To take advantage of all new properties, however, you’ll need to upload an XPI. The browser preview image at the bottom of the screenshot is what becomes the main image for the theme on your theme page. It better reflects how Firefox will look after you install the theme, instead of just showing the background image. If you run into any problems with these new tools, please report it here. The Personas Plus extension has been a handy companion for theme designers for years. It makes it easy to create themes, preview them, and use them locally. Its successor in the new world of themes is Firefox Color. Firefox Color is exclusively a development tool for themes, so it doesn’t match all features in Personas Plus. However, it should cover what is needed for easy theme creation. What about the 400K+ themes already hosted on AMO? We’re keeping them, of course, but we will transform them to the new format later this year. So, if you’re a theme designer and want your theme to be updated, don’t worry, we got you covered. And please don’t submit duplicate themes! After the migration is done, we’ll notify you about it. The main difference you’ll notice is the new preview image in the theme page. You’ll then be able to submit new versions of your theme that take advantage of the new theme properties. You’ll also notice that all new and migrated themes have different editing tools to change their descriptions. They are very similar to the tools we use for extensions. They may take a bit of getting used to, but they provide great benefits over the lightweight theme tools. You’ll be able to set a Contributions URL, so your users can compensate you for your work. 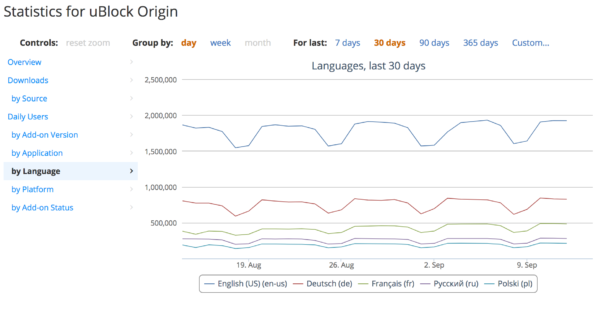 Also, you get a detailed stats dashboard so you can learn about your users. This may seem like a small step, but it’s actually been a large undertaking. It’s taken years and over a dozen people on the Firefox and AMO teams to finally get this out the door. I won’t even try to list everyone because I’m sure I’ll forget some (but thank you all anyway!). We’re very excited with about these new themes, and hope they will lead to even more and better Firefox customization. uncomparable to full enterprise version, what to compare for? I’d like to see you create a userChrome.css file and place it into Chrome. Firefox is vastly superior to Chrome in terms of customizability simply because of userChrome and userContent. Why would I want a custom chrome.css? If it’s not included in the built-in GUI options, it’s not worth my time. Firefox before Quantum had real themes, now all it can do (with this here) is customize CSS colors like Vivaldi and Chrome. Big deal. So where will I find Holiday pictures and Fandom themes like I used to love with Personas before you messed it up? Can you elaborate on how you’re having trouble finding things? I think I read that you were planning on taking away the ability to hover over a theme to preview it. Is this still true? That was removed a while ago for performance reasons. This is a great news but I have a suggestion, like in Firefox Color the active Tab Line color, must be the same of text color or independent to customize. In the new Theme Generator the inactive tabs text color, paint also the Tab Line of active tab and this is absurd. Can you email amo-admins AT mozilla DOT org with more details? We can help you figure out what happened and how to remove them if necessary. Great, though I’ll probably just stick to the official dark theme like I have been since it was introduced. That’s all I want out of themes, a pleasantly simple one. Now get a dark theme on the Firefox for Android app! While they’re at it, they could try to make it render and zoom pages competently. I am currently not able to submit one of my theme designs on Firefox Color. I am currently in total “frustration” trying to figure all this out. I am going on 80 and change is not a good thing for us elderly. I am sure I will eventually learn all of this but this is not making it any easier! I am receiving emails about this so apparently I am not the only one! Will I be able to submit my theme designs using Firefox Color eventually? I have other questions but don’t want to submit too many at once! Firefox Color at the moment doesn’t allow you to submit to AMO. Change is inevitable. As with any change, comes bumps in the road…while I may miss some features from Personas Plus, I am sure I’ll adjust to the new format. Give it some time! How do you get one of these new themes to work on Android Firefox? I just uploaded a theme on this new system today (my very first one, with my last theme on the old system being just three weeks ago), and I am having an absolutely frustrating time getting it to also work on Android Firefox. The theme comes up blank when you have it installed, and sometimes the theme’s listing does not say anything about not being compatible with Firefox Android, and sometimes it does. I have done everything I know to do for the time being, including uploading an XPI file of the theme and checking off the box that SHOULD get it to work on Android Firefox as it does on the other platforms. What makes this all the more exasperating is that the theme I am trying to get to work on all platforms is technically a lightweight one, since I only did the background and foreground lettering and nothing else. I understand the new system otherwise, and when the Firefox Android problem is hopefully solved soon, I do not have any other issues. Thank you in advance for any and all help and advice. Firefox for Android doesn’t support the new system, though there are efforts to add support. AMO should tell you that they aren’t compatible. Is there someplace where we could make a theme for mobile still? Hi MaDonna, don’t despair! When you are viewing one of your Firefox Colors themes, the page has a box with the numeric values you need to submit your theme either through the Wizard or as an XPI (although that might not be needed unless you want to tweak a lot of colors). Obviously transcribing all of that so you can copy/paste it somewhere else is a hassle. It could be extracted out to a more usable format using a script. You can run scripts against the displayed page using a variety of methods, such as (A) the Web Console (one of Firefox’s built-in developer tools), (B) a bookmarklet (a script you save on your Bookmarks Toolbar or Bookmarks Menu for quick access), (C) a user script (a script you apply using an extension like Greasemonkey, Tampermonkey, or Violentmonkey), or (D) a full-blown extension. Thank you, Jefferson…I am not currently using Firefox Color to make my designs. I am still using Personas Plus to test new designs when I am making them. But I am aware that PP will be going away sometime in Nov. I am not looking forward to that. So apparently I will have to do all my testing through Firefox Colors, is this correct? You can’t add a footer.jpg now, that’s unfortunate. A theme looks very incomplete with a bright white bar for the search tab where we used to be able to choose a footer image as well. Please bring this feature back. This doesn’t seem to be compatible with Firefox mobile. I am able to download it on mobile, but when I try to apply it, all nothing changes. If I play with a few buttons, such as enabling and disabling, at best, it goes back to the default white theme even if it is enabled. I have tried with various color configurations, and even left everything default and just added the bar image with no luck. Any word on when this might work with mobile? How do we upload an XPI? I noticed I had one in my extensions and removed it because I knew I had never installed one. Or didn’t know I did.